The number of registered performers to Streamate.com is around 9,500 and I’d estimate the average number of online hosts at about 400. Notice that you have a daily limit which you can change at any time for how much you can spend in a day. Party Chat - It's kind of a group show, but not quite. I wish I could explain it in just a few words, but since I really can't, go ahead and read my detailed explanation below. Really, I ought to get like a trophy for all the work I do for you guys. Gold Show – This is one more type of group show, where users pledge a certain amount of Gold and when a specific goal is reached, the show begin. Click Here to get some more info about this option. User Comments - offer a nice insight of what other members thought about a specific video chat room, but remember: A. You don't know who they are and B. Taste is an immeasurable factor. So do take a look, but don't; just believe everything that you read. Similar Host - When you enter a performer’s profile page to read about her or to start a live webcam chat with her the website shows you 4 other similar hosts to the one you are chatting with on the right hand side of the screen and even give you a link to view more if you like. So if you are only interested in a specific type of women, you don’t even need to go back to search you can just pick from the list already in front of you. This feature saves you time and hassle and gives you more opportunity to spend time chatting with hosts. Ability to choose between two video box sizes. Visible or Invisible mode - click on the Eye icon on the video chat window and choose between having what you type seen or unseen by other users. See who else is online - I don't know why you'd want to, but if you do, Streamate allows you to see which other members share your free chat room. Similar Models - see other hosts that share resemblance with the one that you are currently chatting with. Video Chat FAQ - confused about the video chat rules? On Streamate there is a very funky feature that lets users get some instant answers to their questions without having to leave the chat room. Just click on the tiny question mark, right on the video chat window, and you'll get some basic assistance. I've added a screenshot to make this clearer. These 2 types of shows are pretty confusing and there is no clear explanation found on the FAQ page regarding these shows. I’d like to suggest to the site to offer some quick explanation (yea yea, I know users may have gotten some mail update, but give me a break – no one reads these), but for now I will take this task upon me and give you a quick review on each. Party Chat is really just a mode, which is part of free chat. It allows all users to see the list of other members who are on the chat room, as well as to see each other’s messages. This is I guess what makes it into a Party, but if you are shy and don’t like to be noticed, then maybe this is not the best option for you. Any livecam model that offers this option is tagged by a yellow "Party Chat" sign. You can easily find all the performers that have this option by clicking on the Features link at the upper part of the video chat page and then pick Party Chat. Gold Show is a special type of group show. Any member who wants to reserve a spot in the gold show needs to agree to send around 10-15 gold (around the same number in dollars) and when the goal is reached, the show begins. There are the 2 counters, one stating how much "gold" was raised (enough users need to contribute Gold for a show to begin) and a time countdown counter. If the goal is not reached by the end of the countdown, users are not charged. The biggest advantage of the Gold show is cost: It goes for as low as $1 minute, which is cheaper than any other adult webcam show. The biggest disadvantage is the fact that you cannot rate it, so it's hard to assess which model offers good value for this deal price. Maybe it's just me, but I think that since the redesign there are less hosts offering Gold, but maybe that's just because of the new layout. In any event, you can easily recognize a webcam model that offers a Gold show through the icon on her videochat picture, right on the main page. Upper Navigation Bar - Offers a few options to help you sort out live chat rooms including region, features and more. I found was the most useful tool of all, because you can narrow down the live cam results until you are left with what you really want to see, and you don’t even need to conduct an advanced search for it, you just click. Free Search Window - It is what it is. You type in any word and see what comes up. Advanced Search (See Screenshot Below) - This great tool enables users to look for very specific criteria. Just don't get too specific or you won;t have enough results left to choose from. A lot of cammers are also interested in chatting with new performers, reasonably assuming that such models will be more enthusiastic and will have more enjoyable as well as less expensive live shows. Different adult webcam sites have different methods of directing users to new hosts and on Streamate you can find them by clicking on the New Models link at the top of each page. Customer service representatives are available to you 24 hours a day 7 days, 365 day a year. 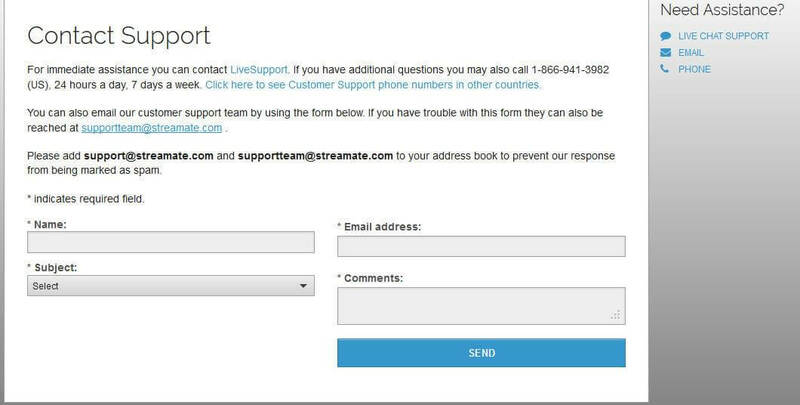 You can contact either by phone - 1-866-941-3982, or by email - Supportteam@streamate.com. You can also fill in a Help Form, just like the one you see below. Please don’t try to fill this particular one up. It is only a screenshot. For any further information, simply click on the support tab and you will be directed on how to contact them from your country. You can also find a link to the FAQ page on the support page which provides you with helpful information on many basic questions most visitors have. So you may even find answers to many questions you have without having to contact customer service. The webcam chat site is available in 8 different languages and you can find hosts which speak each of those languages. Simply click on the language you would like by choosing one from the list which is located at the bottom of every web page on the site. Recently we have been approached by several users that wondered why we do not review some well-known webcam sites. Since many of the adult webcam sites in question are basically white-labels of Streamate.com, we decided to clarify this topic once and for all. Streamate is quite unique in the live cam industry because it offers quite a few white-label websites. By "White Label" we mean additional live cam sites that are almost identical to Streamate.com. They have exactly the same chat rooms and hosts, but run under another name and with their own design. There is no difference between the sites other than the layout and URL. In fact any payment you make on any of these websites will appear in your billing under Streamate.com. Since the white label Streamate sites are identical, there is really no reason to review them separately. However, since some of these white labels are pretty successful, we decided to list them here for you to know. The new Streamate design adds a lot to the site's new appeal, but it's far from being its only advantage. This webcam chat arena is fun, friendly and complication-free, and users evidently love it because they keep coming back for more. There's a great variety of features, excellent discounts and the live shows are spectacular. The fact that the site offers an exact free show schedule and a handy FAQ demonstrates that it really sees users' needs and issues and makes sure they could find what they want. The site doesn’t have as many special features as some of the other sites which doesn’t take away from the quality of the hosts but it would have been nice to have some more options for special discount rates and interesting promotions. It always makes visiting a cam chat site a little bit more fun when there are fun contests or short-time-only promos going on. Streamate.com has a very wide selection of hosts in numerous categories, which are easy to locate thanks to simple and easy-to-read navigating tools on the site. Hosts are friendly and energetic and always give top quality shows. Plus the HD quality cams that most of the performs have on the site make watching a live chat here a very pleasurable experience. I found the site to be worthwhile and not too steep with the prices.